Markley Hut during a beautiful spring day. This is the rebuilt hut, done in 2003 a few hundred feet from the original hut site. Markley Hut was built in 1964 with the intention of Green Mountain being the high route between it and Lindley Hut. This noble idea was problematic because Colorado’s unreliable snowpack often precludes midwinter travel in such terrain. In late winter or spring with stable snow, however, such a tour is quite rewarding. This is an easy hut to reach from Ashcroft, and doing so makes a good novice rated introduction to hut skiing. 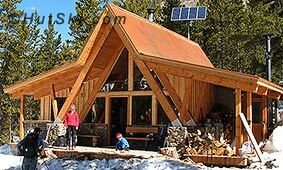 For experts, Green Mountain rises south of the hut, and there are always the high regions around Taylor Pass for folks who seek tours beyond those detailed here at HutSki.com. Find your GPS coordinates (WGS 84) by dragging and dropping the red marker, zoom in for accuracy. For a larger map designed for printing, please click here. Arguably the easiest to reach of the Braun Huts, Markley is a good introduction to hut skiing. But wait, this route is still far from a dip in a warm bath, as it does cross below several large avalanche paths. Check the Aschcroft Trailhead description for parking info (see menu above, or this page intro); you’ll probably park across the street from the Toklat buildings; obey parking signs. From parking, follow a public access trail that leads NE across flats to Express Creek Road, where you cross a bridge over Castle Creek. If in doubt about parking or the route from parking, inquire at the commercial ski touring operations office near the snow plow turn at the end of Castle Creek Road. Once you’re past the bridge and on the east side of Castle Creek Valley, ski up obvious cut of the Express Creek Road as it makes a long southerly climbing traverse. After about a mile the road crosses the lower portion of an avalanche path dropping from the west side of Ashcroft Mountain, and less than ½ mile past this slope the road takes you across another avy path. Here at HutSki.com we feel the traditional—and still best—way to deal with these slopes is simply cross them quickly one skier at a time. They are relatively inactive and only slide to the trail several times a year. If conditions are extremely dangerous, you can avoid these slopes by dropping lower into the drainage, but this entails laborious bushwhacking and route finding. Indeed, during high avalanche danger, the more prudent course is simply to turn back—or not leave in the first place. After you cross the avalanche paths mentioned above, you’ll pass through sparse aspen forests, and about two miles from Ashcroft you’ll come to a trail that forks right. This is the spur to Markley Hut (there may be a sign here). Do not continue up the main road, but rather take the spur trail as it heads near the creek and upvalley a short distance to the hut. You are in the midst of prime avalanche terrain at Markley Hut, so be careful. You can find practice slopes on the lower reaches of Green Mountain south of the hut. Green Mountain summit is a good goal For an easy tour, head up Express Creek from the hut, staying to the timbered center of the valley to avoid avalanche runouts. Continue to Taylor Pass ridge for a more advanced route but beware of avalanche slopes. Don’t mistake this for the Green Mountain near Independence Pass, (or for that matter any of the other 598 Green Mountains in North America). Park at Ashcroft or base out of Markley Hut. From the vicinity of the hut head southerly across the drainage to an obvious narrow gulch dropping north down from Green Mountain. Climb ½ mile up through conifers on the right side of the gulch. At 10,800 feet, cross to the left side of the gulch to avoid an avalanche slope on the right. Stay left, and climb over a few hillocks into the larger basin left (east) of the drainage. Continue up the basin to a distinct saddle (11,440 feet) on Green Mountain's Northeast Ridge -- this is HutSki.com's type of place! Continue up the ridge, veer slightly left at several steep sections, and follow the ridge to the summit. Enjoy the views here, including a unique angle on seldom-seen Star Peak’s north face. You have several options for descent. With avalanche danger, descend your ascent route. If you deem slide hazard to be low enough, enjoy steep glade skiing on the north face or descend the Northwest Ridge. With very low hazard, ski the gully and drainage from the summit.